The NuFace® Facial is a great way to get a nice lift for a special event or to look your best in the mountains. It’s also a great way to see how the device works. The lift from the facial usually lasts 3-4 days. Since the treatment is included in a 60 or 90 minute facial, you also get all of the benefits of our signature facial, deep cleansing, enzyme exfoliation, extractions, a nourishing mask and beautifully finished off with serums. The best way to maintain & improve the lift is to use the device at home consistently. The Trinity Pro facial toning device, a stronger, more effective device, is only available for purchase through a licensed esthetician, comes with a 2 year warranty and is the same price as other models sold online. The device comes with the facial trainer attachment and two others are available separately, the ELE attachement & the red light wrinkle reducer attachment. The device comes with starter gel, which is used to conduct the micro-current. It’s clinically-tested, consumer reviewed and produces real results, like improved facial contour, lifted skin, facial tone, and wrinkle reduction to give you a more radiant & youthful looking face. You can give yourself a professional treatment in the comfort of your own home in as little as 5 minutes per day. The cost is $325 and is available for purchase in our studio or we can ship for free. 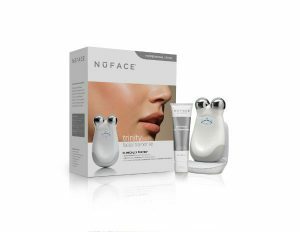 The device has a great battery life, comes with a charger and is ergonomically designed to stimulate the surface area of your face and neck with a gentle micro-current. The current is basically toning your facial muscles. Since the skin is attached to those muscles, it effectively lifts the face. The device also reduces puffiness, which is great around the eyes. Water based serums, like Sanitas’ hyaluronic concentrate, can be applied under the gel for product penetration. It is a great alternative to a facelift or botox. If you’re into natural solutions to aging, this device is for you! Best results come from a home regiment of at least 5 minutes per day, 4-5 days per week for 2 months and then 2-3 times per week after that to maintain results. Best to use either in the morning or evening, only once per 24 hours. Apply a thick layer of gel to the face & neck. Glide the device in slow upward strokes, a minimum of 3 times per area. Start at the neck, go along the jaw line, go over the top of the lip to the cheek bone, under the eye, above the eyes. Can also hold for a few beeps on your brow or your jowls! There are plenty of videos on the NuFace website or you can search youtube to learn new tricks. Wash your the gel off your face, apply your products and go about your day or go to bed. 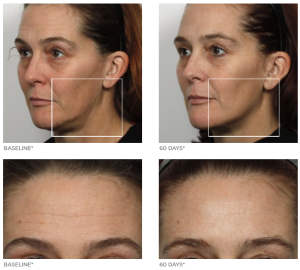 Decreased fine lines and wrinkles. For more information, don’t hesitate to call, please ask to speak with a licensed esthetician. We also respond quickly to email inquiries.